© 2014 Donlevy-Rosen & Rosen, P.A. INTRODUCTION. Individual Retirement Accounts are protected from creditors to varying degrees under state and federal bankruptcy laws. A recent U.S. Supreme Court case (Clark v. Rameker, June 12, 2014) held that “inherited” IRA’s are not protected in bankruptcy. The Court undertook a scholarly analysis to reach its decision that an inherited IRA is not a retirement account and is thus not eligible for creditor protection. Even in Florida, which provides 100% protection for the IRA and for any distributions from the IRA, would you now be confident that a U.S. court will always recognize that protection? Or will a court find some loophole to satisfy your creditor’s claim? WHAT YOU CAN DO. What can you do to protect an inherited IRA from your creditors and to enhance state and bankruptcy law creditor protection provided for your own IRA? Following the asset protection rule of “removing the ability of any U.S. court to disrupt your planning = protection“, IRA assets can still be fully and effectively protected. How? 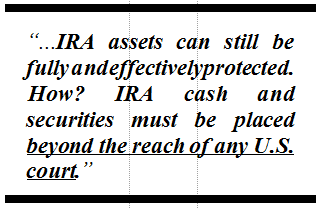 IRA cash and securities must be placed beyond the reach of any U.S. court. Utilizing a strategy developed by Donlevy-Rosen & Rosen, P.A. 12 years ago, this is accomplished by causing the IRA (using a specialized U.S. IRA custodian) to establish a single member offshore limited liability company governed by properly structured operating documents containing specific protective provisions. The IRA contributes (transfers) all of its cash and securities to the LLC in exchange for a 100% ownership interest (member interest) in the LLC, leaving the U.S. IRA custodian directly holding only a member interest in the offshore LLC. The LLC is now the “investment” of the IRA. As long as no significant litigation threat exists, the LLC accounts may continue to be held at the same U.S. financial institutions (now titled in the name of the LLC) and may continue to be managed by the same investment advisor(s) as before. In the event of a creditor attack seeking to reach the retirement account assets, the manager of the LLC would then relocate the LLC assets to a suitable offshore financial institution. At this point, the cash and securities in the LLC (the IRA assets) will be beyond the reach of any U.S. court – fully shielded from U.S. creditors. THE KEY: This strategy is not based upon the unreliable “charging order” protection ostensibly provided by LLC’s under state laws. The charging order “protection”, to the extent it exists at all, depends upon a U.S. court interpreting the law in your favor – something you cannot count on. The foundation of the protection described in this issue is simple: when this planning is properly implemented, the ability of a U.S. court to reach the IRA assets has been eliminated, and that equals real protection. YOU MIGHT ASK. The U.S. IRA custodian still holds a 100% member (ownership) interest in the LLC – can’t the court just order the custodian (which is subject to U.S. court jurisdiction) to demand a return of the cash and securities from the LLC? Of course, a court could enter such an order, but the properly structured LLC governing documents would require the offshore manager (which has signature control of the assets and which is beyond the power of the U.S. court) to comply only with the voluntarily made instructions of its member (the U.S. IRA custodian). Demanding or requesting a return of the cash and securities held in the LLC in compliance with a court order is not a voluntary instruction. The offshore manager would be required by the operating agreement to decline the involuntary demand or request. A mechanism must be included in the LLC governing documents which would enable the offshore LLC manager to be 100% certain that an instruction is voluntary. What would that mechanism be? The LLC governing documents should require the LLC manager to obtain a statement – under oath – from the IRA custodian to the effect that the request or instruction being made is being made without the interference, involvement, or order of any court. A court cannot order the custodian to lie under oath – that would be ordering it to commit a crime (perjury), and that would be a violation of the fifth amendment of our Constitution. OTHER ISSUES. Another matter which must be addressed in the LLC governing documents is the possibility that a U.S. court orders the IRA custodian to distribute or transfer its 100% member interest in the LLC to a creditor so the creditor (new owner) can make a voluntary demand or request for a return of the IRA assets. The governing documents should provide that the LLC manager shall not recognize a change in the ownership of the LLC other than a voluntary change by the original member. CONCLUSION. Utilizing competent counsel, you can take matters into your own hands and enhance the protection of both inherited and your own IRA funds.